Vintage Airplane Labels - These Address Labels are reminiscent of vintage airplanes. 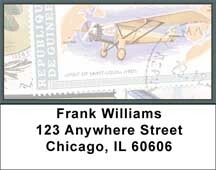 Each airplane is creatively and artistically framed as a postage stamp. What a great way to celebrate a bit of history with these classic airplane Labels!